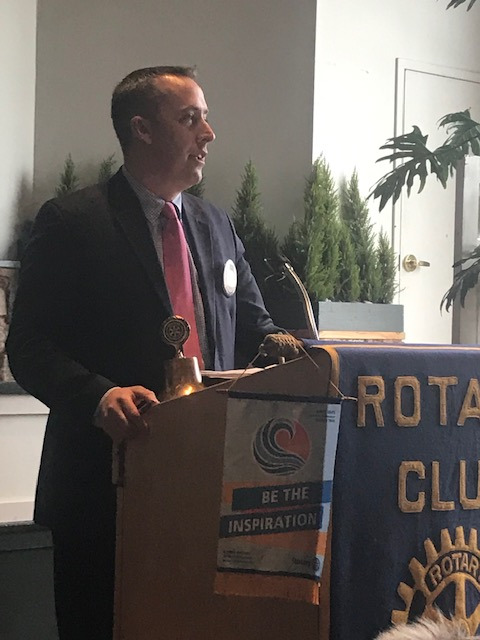 Welcome to the Rotary Club of West Hartford! 2. We had three visitors today Mary and Joe brought Ralph Balbasare and Kyung Soon, who had just arrived from South Korea. A future member, Tanya Falcon, was also our guest. 3. 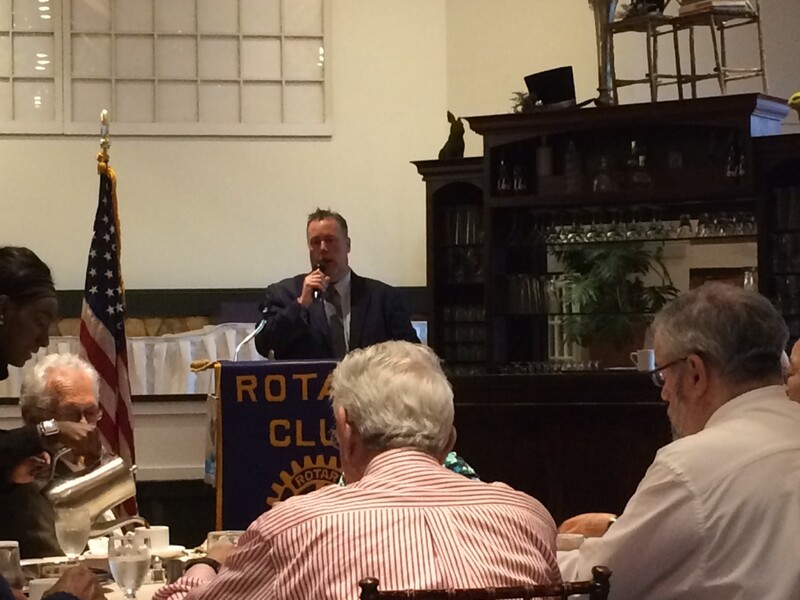 Our Club is still behind in our contributions for the Rotary Foundation and Polio Plus. Time to send in your donations. 4. The books have arrived for the Dictionary Project. We need at least 3 SUV’s to haul them from the United Bank to the Pond House so that we can place the labels and assign volunteers to each elementary school. The labeling is scheduled for April 29, our Club Assembly Meeting. 1. Ms. Briann Greenfield from the Harriet Beecher Stowe Center was our guest speaker. 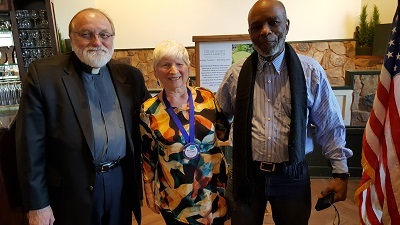 She gave a slide presentation of the accomplishments and works of Harriet Beecher Stowe. Harriet was born in Litchfield, Connecticut in the year 1811. She came from a very religious family and was active in the movement to abolish slavery. She is best known for her novel Uncle Tom’s Cabin which depicted the very harsh conditions under which most African slaves lived. To support her depiction of slave life she also published testimonies made by former enslaved African Americans. Her work reflected the belief that slavery demeaned society. 2. Our club is still hunting for a place for next year’s Vines of March. Some suggestions are under consideration, but no place has yet been selected. 3. Tony Rodriguez is exploring ideas and sites for this spring’s Jazz Brunch. He has set up meetings with other venues in Hartford or West Hartford but has not yet selected one. 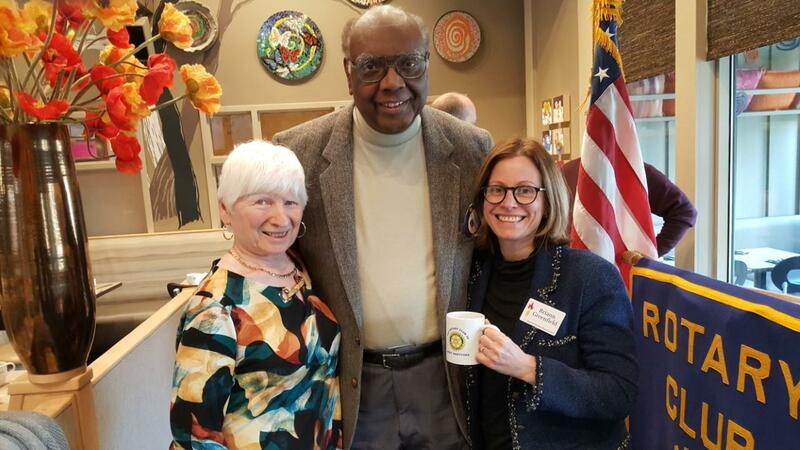 Rotarians Mary Silverberg and Booker DeVaughn with guest speaker Briann Greenfield. 1. In spite of the snowy weather we met to discuss the upcoming Vines of March. Items of importance were finalized. 2. Fortunately, the weather on the 9th was great. So was the event. Thanks to all that contributed to its success. Kudos to Kyle and Tom. Here are the results of our fund raising. 3. Next year’s event is looking for a new location. The University dining area is due for renovation and will not be finished in time for us to use it. 4. Our speaker for Monday the 18th will be Kate Sims, our District Governor. She will inform us about coming events and news about other clubs in District 7890. 5. We can never thank Saint Joseph University enough for the help extended to our club over the past two years. 2. 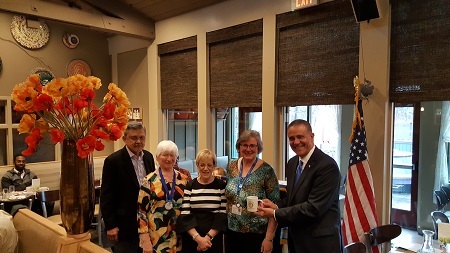 Eileen Rau reminded us of the Rotary Foundation birthday. The best way to celebrate is to donate. Polio Plus can also use a little pick-me-up. These donations make our work worldwide more fruitful. 3. Volunteer to help with the Dictionary Project. Bennett offered his garage and Liza offered a room for storage in the bank. 4. The Vines of March is just around the corner. We still need to sell more tickets. So far, we estimate 140 have been sold. Our sponsorship funds have reached $9,000. Thanks to all! Auction items are still lacking. Eileen and Bob Rau have donated three I-pads to supplement our silent auction items. This will certainly make that auction exciting. Our regular auction is lacking the usual vacation properties this year. We need volunteers to pick up food donations from participating restaurants. Please contact Patricia Kiely to get your assigned food pick-up restaurants. 5. The Fresh Start Pallet group gave us a presentation of their work. Their mission is to help people by employing them in making furniture out of discarded pallets. Their goal is to help the unemployed by training, building confidence, and enhancing skills to enable people to become productive independent citizens. 1. Let's welcome our new Member, Jeff Shaw. 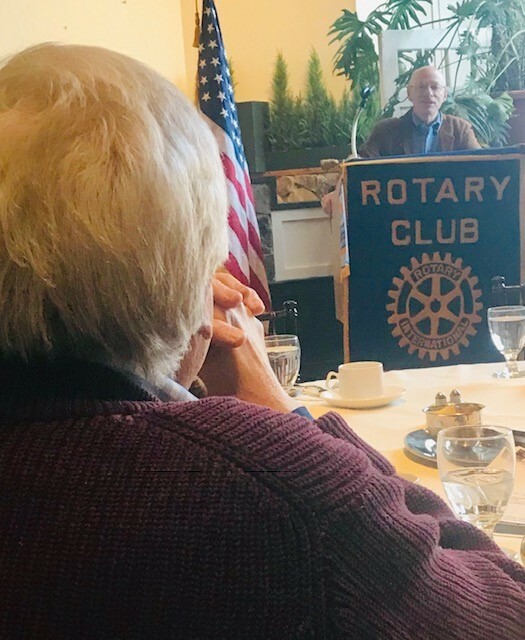 He has attended our meetings and holiday party and chose the West Hartford Rotary. Two more prospective members are attending this meeting to see how we conduct our meetings and get to know what our objectives and goals are. Make sure we make them feel welcome. 2. The Dictionary Project is creeping up on us. Christine Looby needs volunteers to mark up, store and deliver the dictionaries. 3. The Blood Donation project was a success. The question remains as to whether we should make this a yearly event. Let your voice be heard. 4. It is CRUNCH TIME for our Vines of March. We need volunteers to pick up food donations from participating restaurants. Please contact Patricia Kiely to get you assigned food pick-up restaurants. 2. Last meeting was used for club assembly in order to organize for the upcoming Vines of March event on March 9. There are still many items we need to accomplish – selling more tickets (only 70 tickets are currently sold), getting more sponsors ( Kyle stated that at present we have around $6,000 worth pledged ). We have received the needed health certificates and insurance and tax exemptions are on hand. Auction items are still slow in coming. The restaurants that have been mentioned have to be finalized for mention in our list in the booklet. 3. Prasad, chairman of the Rotary Foundation from District 7890 made a pitch for the Hartford :Youth Scholars Program. Prasad is looking for donations from our club and the surrounding area clubs to help with the purchase of computer tablets. In the past our club has been helpful in this effort. Prasad also talked about How important Rotary is in promoting education and health benefits to people who need help. This can only be accomplished with our support. 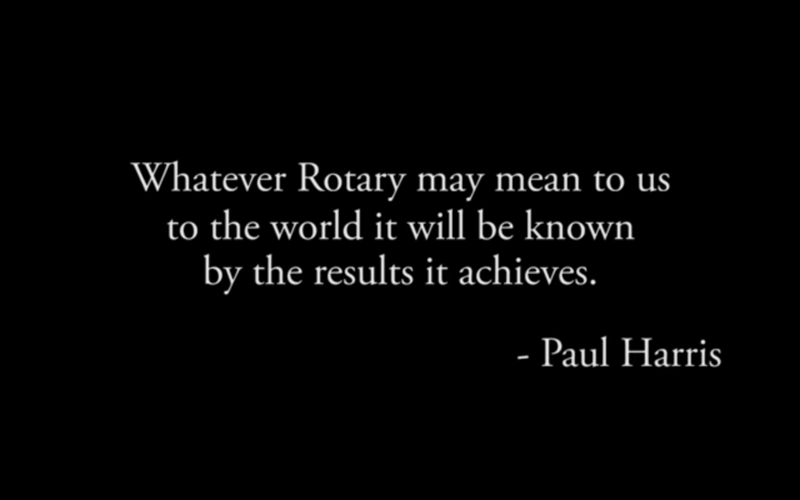 This is the 114th anniversary of the Rotary Foundation. 4. On March 14 the Children’s Museum is hosting a Gala, Live Auction and sit-down dinner at the Delamar Hotel. They are asking us to be an event sponsor. They are also looking for table sponsors; tables are $1,200. We will take up this question at our next board meeting. Anyone interested in attending, please contact Oscar. Erin De Francesco, Dir Community Educ.